This Shop is the site to sell a part set of the Ornithopter by 3D print. When you order, 3D print by Shape Way will be ordered. A product is delivered to your address from Shape Way ( Netherlands ). The payment is PayPa or Bank transfer. 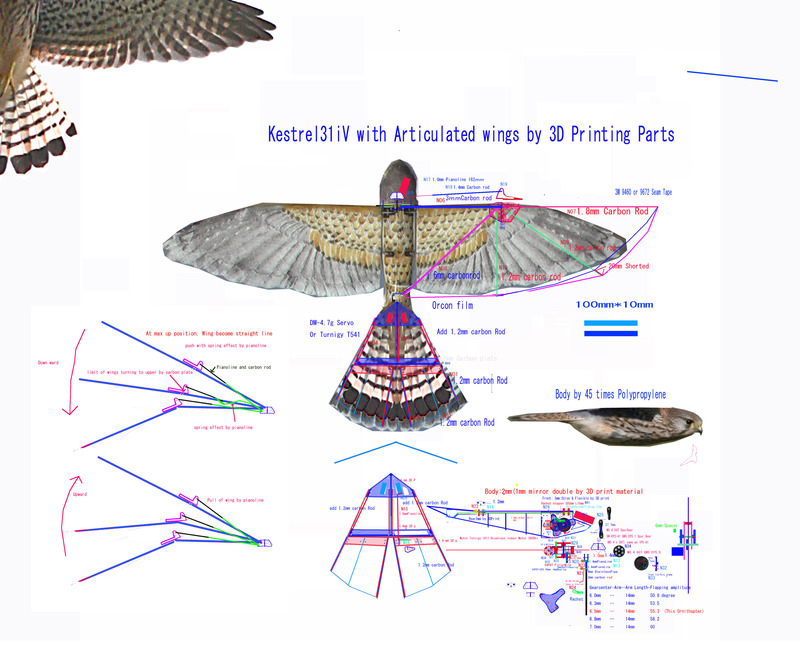 If it is necessary, I give Kestrel31iV file of Autodesk 123D Design to the person who purchased 3D print Parts Set. You install Autodesk 123D Design in your computer and can correct the file. When a part was broken, you can order it to Shapeways directly by the correctted file. You can make your original ornithopter by remodeling Kestrel31iV file to your original design. Please give me a mail. Please write order number ( Order# ) of Shape ways clearly. It isn't possible to do a repayment. When there is a question or a consultation in assembly , please give me a mail. ２）とはサーボケースの大きさが違います。他は同じです。Size of Servo case is different from 2), and others are the same. １）とはサーボケースの大きさが違います。他は同じです。Size of Servo case is different from 1), and others are the same. I produced the parts of Kestrel31iV by 3D print. The final weight is same as that of Goshawk25iV with articulated wings. The base of the tail that did a fracture at crash was improved by carbon plate. It has already be corrected this improvement on the plan. 1)Fine processing of Gear Box and Tail assembly etc. became unnecessary. 2)Work to sharpen carbon decreased sharply. 4)Weight was almost same as that of Ornithpter using carbon parts. 5)So that it is able to be made symmetricaly, Flight performance is obedient and is easy to do control.